Secluded and located in a valley at only a few minutes walk from Caccamo, this 400 square meter villa built on 2 floors can easily be divided into two separate accomodations allowing two private living area's. The villa has sea and mountain views. 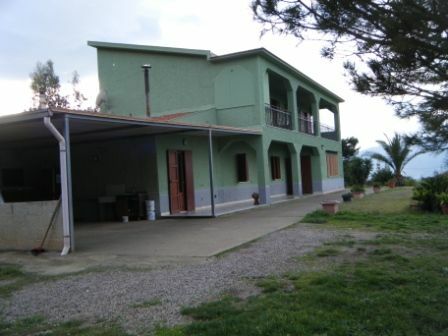 The property holds 4500 square meters of land all fenced in and cultivated with various fruit trees. The main entrance has a remote controlled gate, this leading to a patio area which surrounds the villa and the double car port attached to the side. The outside covered veranda is equipped with an external kitchen area. The villa has central heating on both floors.